The City has just revamped its Façade Improvement Program to provide more entities with an opportunity to receive grant funding up to $10,000 per property, for façade improvements. 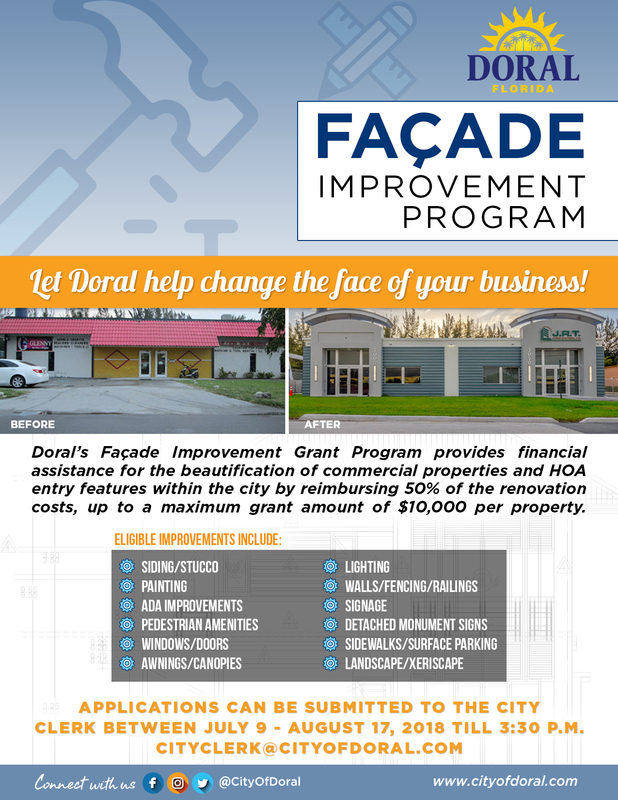 Doral, FL – The City has just revamped its Façade Improvement Program to provide more entities with an opportunity to receive grant funding up to $10,000 per property, for façade improvements. The program is now available for the renovation of all business structures, commercial properties and publicly visible HOA entry features within the City of Doral. Highly visible buildings along major roads and properties within the Doral Décor District will be prioritized. The purpose of the Doral Façade Improvement Grant Program is to provide financial assistance to qualifying parties in Doral to stimulate private sector investment, beautification, economic growth and job creation in the City, by improving the appearance of the buildings within City boundaries. Possible external improvements include: ADA improvements, landscaping, painting, lighting, canopies, and windows. All grant funding is provided as reimbursement for project costs. For full details, please visit https://www.cityofdoral.com/businesses/business-assistance/ and contact manual.pila@cityofdoral.comto schedule your pre-application meeting. Applications are due to the City Clerk by August 17, 2018 at 3:30 p.m. WHEN: APPLICATION DEADLINE: Friday, August 17, 2018 3:30 p.m.